Summers in Mississippi can be brutal, and oftentimes we will do anything to keep our homes cool, even if it means spending the big bucks on utilities. If you always dread seeing your summer energy bill, check out these 10 ways to save on energy costs this summer. Don’t just turn off devices, unplug them or use a power strip to cut unneeded energy. Devices like televisions, computers, stereos, and DVD players are known as “vampire” appliances since they drain power when they’re not being used. Any device with a light or clock on when not in use is a vampire appliance. Another option to save on energy costs this summer is by using outlets that connect to wall switches for these devices so you can easily turn them off when you’re not at home. Don’t let cool air seep out of vents, cracks, and holes in your home. Use inexpensive plastic film from the home supply store to help insulate around older windows or anywhere you feel a draft. Shut the doors and vents to unused rooms. Make sure window unit air conditioners fit snugly with no gaps. Foam and caulking can seal problem areas around the house. Consider adding more insulation in the attic. Spending a little now can help save on energy costs this summer. Get more for your money by packing full loads when washing clothes and dishes. Small loads use the same amount of water and energy, so it’s more efficient to wait until you have enough clothes and dishes to make a full load. Wash your clothes in cold water. They’ll get just as clean. Don’t use the dry cycle on the dishwasher. Let the dishes evaporate dry or hand-dry them. Consider installing a good old-fashioned clothesline and let the laundry dry by ‘solar power’. Use blackout drapes or shades and keep them pulled when the hot sun is out. This makes it easier for the air conditioner to do its job. To save in the future, create more shade on your property by planting leafy trees and bushes in areas that get lots of sunlight. Go with less lighting to save on energy costs this summer. Do a spot check during the day. Chances are you’ll find a light or two on you don’t need. Use natural light instead. At night, have more candlelit dinners. 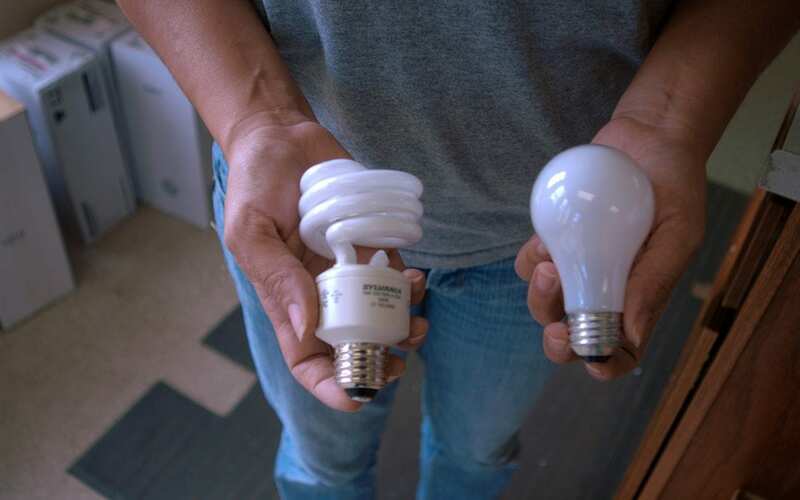 Check to make sure you don’t have any old incandescent light bulbs lurking around. Switch to the energy efficient CFL or LED bulbs instead. An oven uses lots of energy and it also heats up the whole house. Fire up the grill, order take-out, and use the crock pot for preparing meals. Even the stovetop is better than the oven. Summer salads and other no-cook foods are great for summer meals. Most people have programmable thermostats but don’t think about using them. Let the temperature automatically rise when no one is home. Programming the thermostat reduces stress on your HVAC system. If you need help programming your thermostat visit the Energy Star website for directions. Help your air conditioning system run more efficiently by regularly cleaning or changing the filter depending on the instructions in your manual. Contact a professional HVAC technician and get your unit serviced every year. They can check for potential problems like grime buildup, rust, mold, and all those things that hamper efficiency. Go a step further and hire an energy auditor to look for leaks and other problems to help you save on energy costs this summer. If you are buying new appliances soon, make sure they are the new energy efficient ones. This includes major appliances such as televisions, washers, and dryers. If you’re getting a new air conditioning unit, go for a smaller sized one. Larger ones use excess energy. Buy the smallest one appropriate for your home. Hub City Home Inspections serves South Mississippi with home energy audits and other home and commercial inspection services. Contact us to schedule our services.